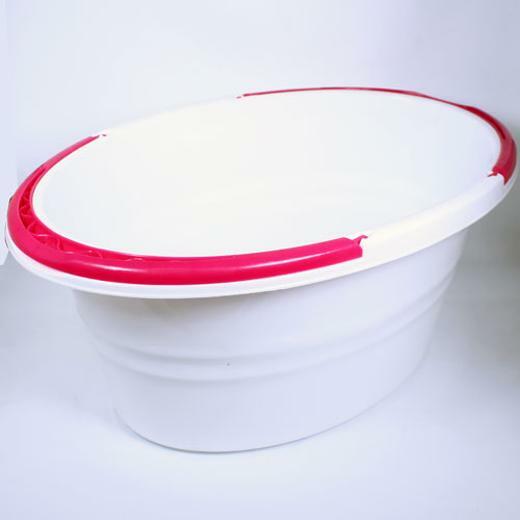 1 high quality x-large white bucket with handles. This white plastic bucket features cerise handles on both sides to make it easier for carrying the bucket around. Great quality white buckets in oval shape. This thick oval white tub with handles is large and is great for mopping and household or business use. These white plastic buckets are reusable! Each of these large white plastic tubs measures 18.5" x 12" by 7.5" deep. L: 18.5 in. W: 12.0 in. H: 7.5 in.